Two great fighting games will come together to make Street Fighter X Tekken. 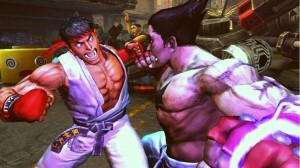 The announcement was made at Comic-Con when Tekken producer, Katsuhiro Harada, interrupted the Street Fighter IV panel. The audience was suprised with a teaser trailer of Ryu fighting Kazuya Mishima. After that the audience was also given a chance to play a live demo of the upcoming game. Street Fighter X Tekken will have a similar look and feel to Street Fighter IV with 2D side scrolling fighting and graphics. Katsuhiro Harada also added that Namco is developing another version called Tekken X Street Fighter that will be more on the style of the Tekken games, with 3D fighting arenas. Both games have a ways to go before being released as they are still working on Marvel vs. Capcom 3. It’s not sad, I love Street Fighter just as much. It will be very interesting to see how two different fighters mix with the different styles. I remember sinking alot of time into street fighter. I’m talking the old SNES 1. I knew every move for every fighter… how sad is that?